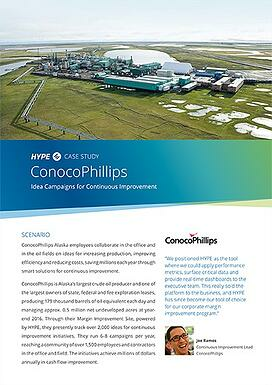 Case study on how ConocoPhillips gathered millions of dollars in cash flow improvement initiatives through the HYPE platform. smart solutions for continuous improvement. Through their Margin Improvement Site, powered by HYPE, they presently track over 2,000 ideas for continuous improvement initiatives. They run 6-8 campaigns per year, reaching a community of over 1,500 employees and contractors in the office and field and achieving millions of dollars annually in cash flow improvement.